↑ Frank Owen (2001). The Fall of Singapore. England: Penguin Books. ISBN 0-14-139133-2. ↑ Smith, Colin (2006). Singapore Burning. Penguin Books. p. 547. ISBN 0-141-01036-3. ↑ Generals At War. Nicholas Rowe, Alistair Irwin. National Geographic Channel, Singapore. 21 September 2009. 60 minutes in. ↑ Klemen, L. "100th Indian Indp. Light Tank Squadron, Malaya 1942". The Netherlands East Indies 1941–1942. Burton, John (2006). Fortnight of Infamy: The Collapse of Allied Airpower West of Pearl Harbor. US Naval Institute Press. ISBN 159114096X. Falk, Stanley L. (1975). 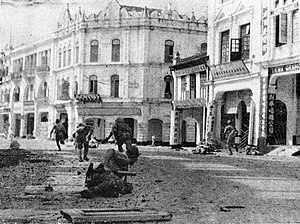 Seventy days to Singapore: The Malayan Campaign, 1941-1942. Hale. ISBN 070914928X. หน้านี้แก้ไขล่าสุดเมื่อวันที่ 11 พฤศจิกายน 2559 เวลา 20:46 น.